Cuddling on the couch with lots of hot chocolate and mulled wine ,and movie marathons seems just perfect for winters right? At the same time, we say hello to fuzzy boots n Scarves and Mittens and Hats--Oh My !! What I really do Not understand or I want to get it correct is that why some girls still show affection to those tanks and shorts? It was just yesterday that I spotted a bunch of girls summer obsessed freaks dressed in their summer shorts and sleeveless tanks(outdoors) while I was all bundled up in a stole over this outfit ! WHAT is going on with all these sleeveless dresses in Delhi Novembers ? That's a tall order, but girls refrain from doing all that - Brrr- It's Cold .. Instead we should all see this summer weather gear with a fresh set of eyes and a heavy dose of winters trends that's it ! Getting noticed doesn't necessarily mean pulling out all the stops. Pls go ahead n winterize those shorts n dresses and at least stay warm, unless you have some really glowing Calves which you wanna flaunt- WORD !! Because this life is a Blue print of Past Karma! Oo, that bag is really peerfect. 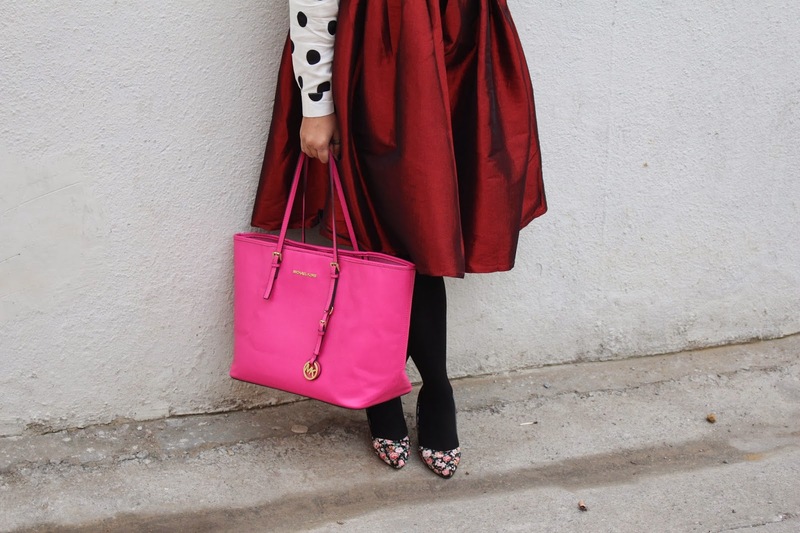 Absolutely love this look, that full oxblood skirt is a stunner and the Mk Bag is the perfect finishing touch! Amazing!! You look like you just got off the fashion runway!! OMG..this is such a regal outfit..fit for a princess. 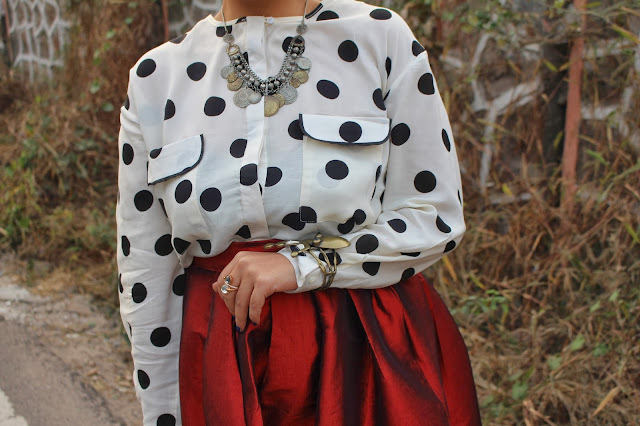 m absolutely loving that polka dot top. U look beautiful. I found your blog by chance, while peeking others and I decided to check it out! I’m glad I did it, because I love it and you've just won a new follower! I'd like to invite you to meet my space as well and I hope you'll have as much fun as I am having in yours! Super great winter outfit!! Love your skirt, dear! 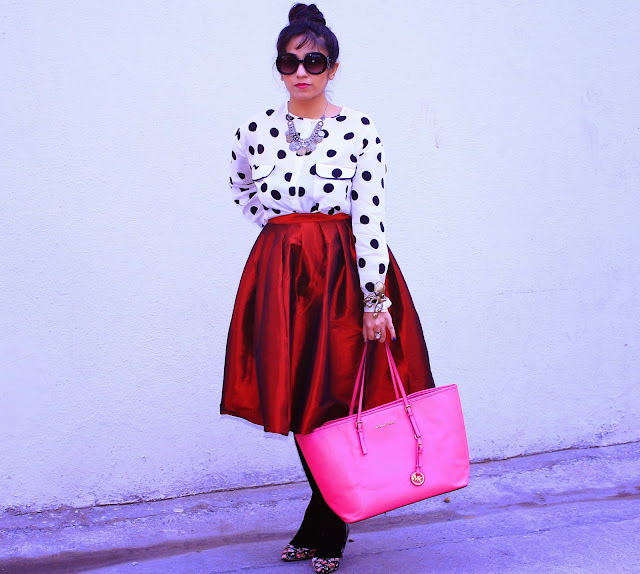 Such an amazing outfit!totaly love it!you are looking great my dear! amei a bolsa esta um show, fotos encantadora sucesso amiga. What a beautiful beautiful skirt it is!!! And you wearing it so well. Would you like to follow each other on GFC? Just let me know so I can follow back. Thank you. i love your skirt...it's amazing! Also, please check out my blog and feel free to follow! Wow, this look is really really cool! oh, love your skirt and also your bag! such a lady like look, love it!! This is very Kate Spade to me. Uptown chic. The skirt & top are soo cute together! Super chic look! Love that top! !